It was on this day, April 5, during the year 1887 when Helen Keller grasped the meaning of the word “water” as spelled out in the manual alphabet with the help of teacher Anne Sullivan. Her blind and deaf pupil had learned to memorize words but failed to connect the words to their meanings. When Anne took Helen to an old pump house Helen on that fateful day, she finally understood that everything has a name. Sullivan put Helen’s hand under the stream and began spelling “w-a-t-e-r” into her palm, first slowly, then more quickly. 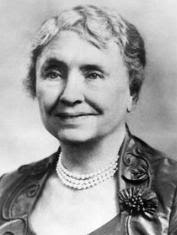 Here's a video about Helen Keller (no captions).